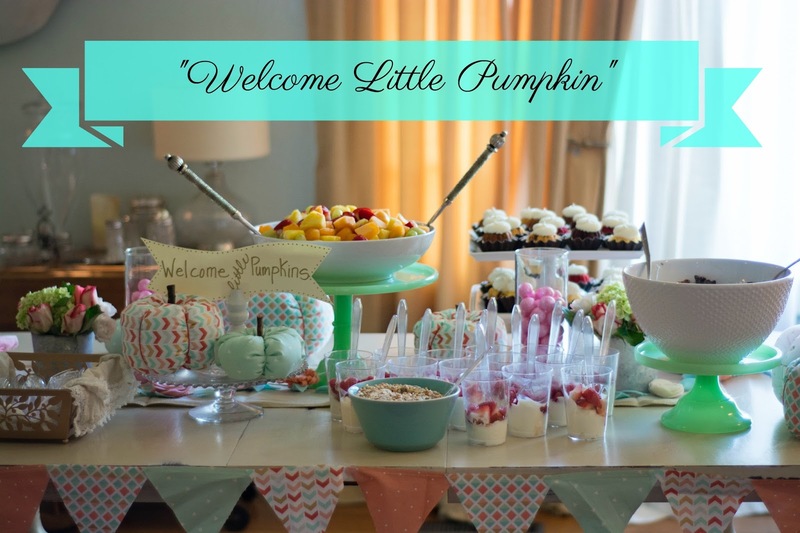 Last year I planned a baby shower for two of my dear friends, Leah and Lacie. They were both expecting little girls and they both love pretty pastels and florals. 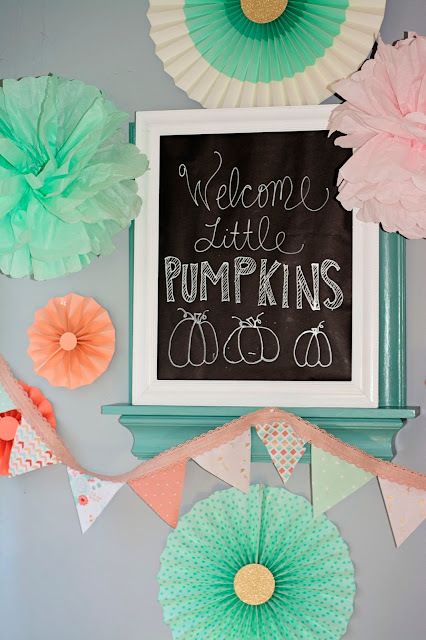 Since the shower was in October, I decided to go with the theme "Welcome Little Pumpkins." I love how everything came out so even though it's almost a year later I thought I'd post the photos and some tips for planning a girly, pumpkin-y fall baby shower. 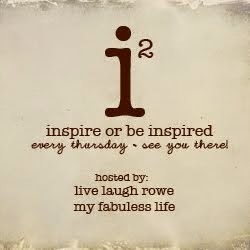 Isn't this the cutest invite?! 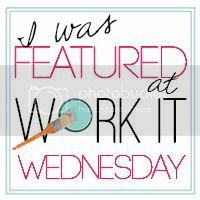 It's from Miss Pok-A-Dot's shop on Etsy. It's my favorite, and the one we used, but there are a lot of other sweet ones on Etsy. 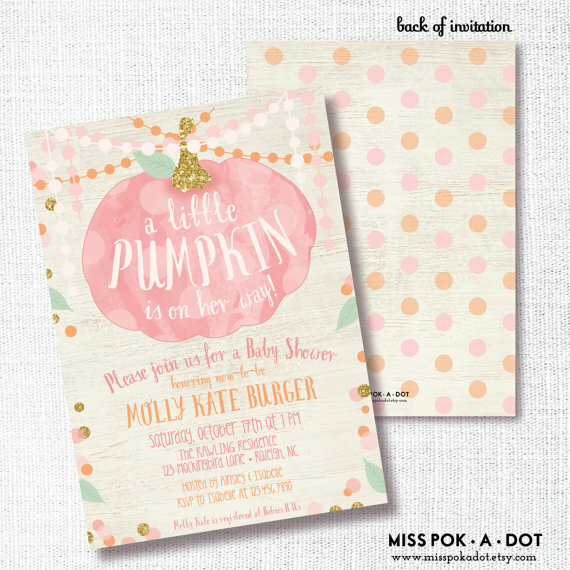 Try searching "pumpkin shower invitation" to see the widest range. 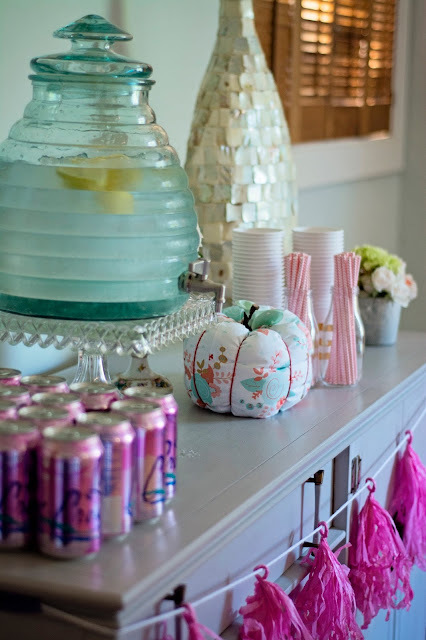 Normal people cannot decorate all the areas of their home for a party. Or maybe just I cannot. Either way, I think you get the most bang for your buck by choosing to focus on decorating a few areas really well rather than spreading your decorations over the whole house. I decided to decorate my entryway, the food table, and my fireplace mantle. The chalkboard was a last minute addition and although my chalk artwork is only meh, I did want to share my hack for making it. I simply took the glass out of a white frame I already had and put in a piece of black paper, then I wrote on it with a white paint pen. Easy peasy. I love those two sweet moms SO MUCH! More paper fans and a banner on the mantle. To make a quick and dirty banner I just stack my fabric and cut a bunch of triangles, then I sew the edges along a piece of coordinating ribbon. 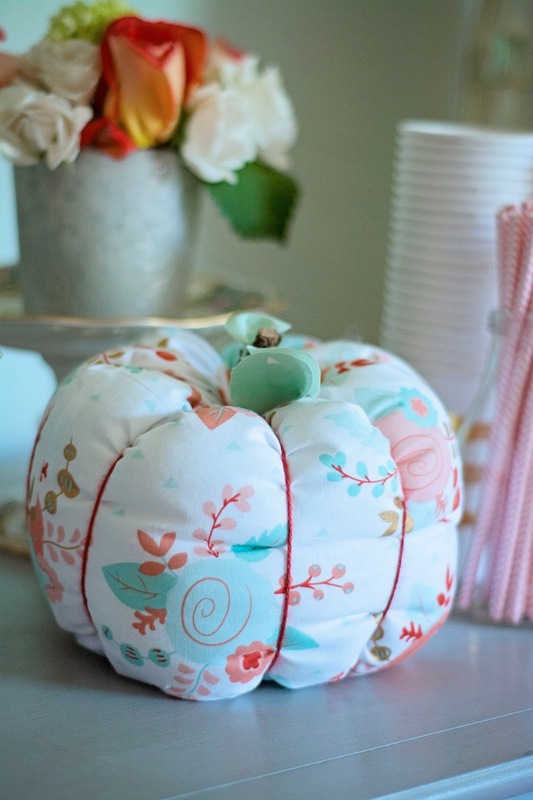 The last and best thing I did was make a ton of these fabric pumpkins in all different sizes. 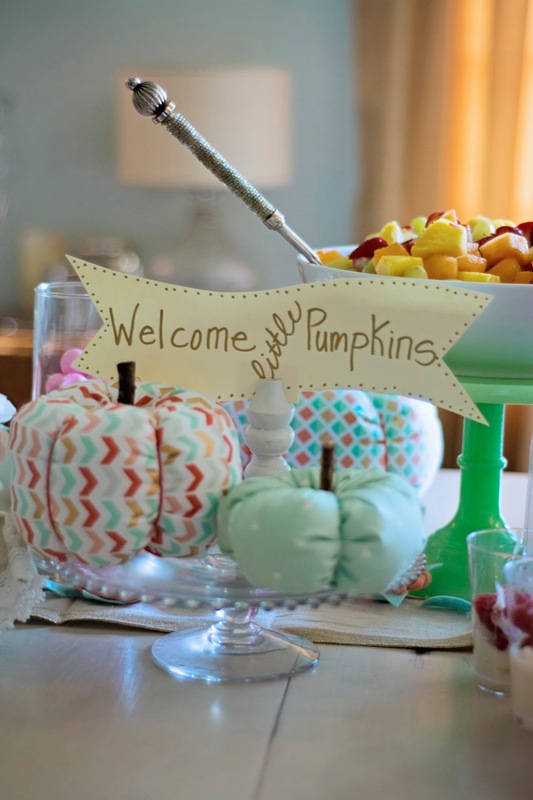 They were scattered on the food table, the drink buffet and the mantle. I already wrote a post about how to make them; please click here if you'd like instructions. They are very quick and easy to do. People on Pinterest are able to color coordinate their food for parties. I am waaaaaay too invested in taste to sacrifice yumminess for all pink food. The best I can do is pink gum balls and pink sodas. C'est la vie! I just finished painting my entryway tile for the second time and I love it soooo much! 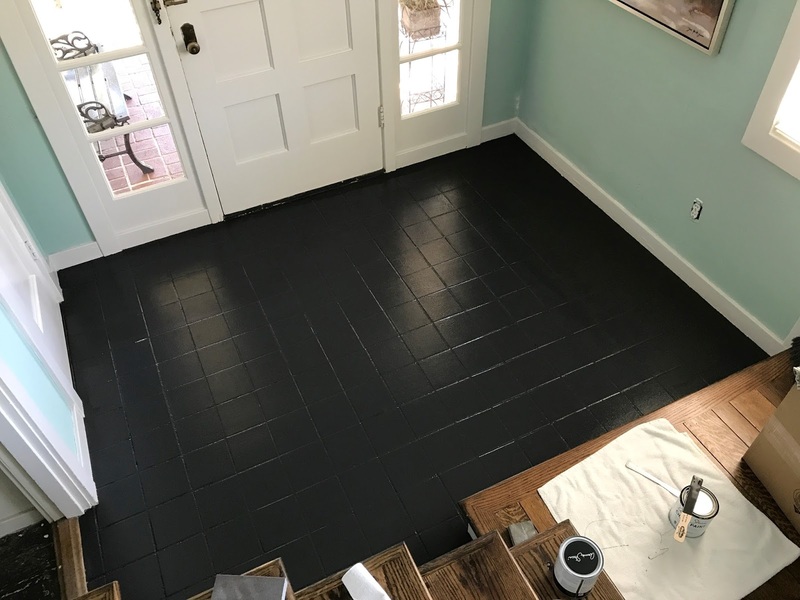 I love it so much in fact that I'm going to share how to do it with you so that if you too have ugly tile floors that you hate you can fix it in one day. Yay! I should probably talk about the stars first, though. They make me so darn happy. I do realize that a galaxy of stars on the floor isn't everyone's cup of tea, but they are mine. I love how they make me feel that I am walking into a magical home. A kind of Hogwarts-ish home. One of the best things about decorating your home is that it's yours. The decorating police aren't coming; you can do what YOU like. When I look online and in magazines I see a lot of white, minimalist homes. They look great, but guess what? That is so not my style! 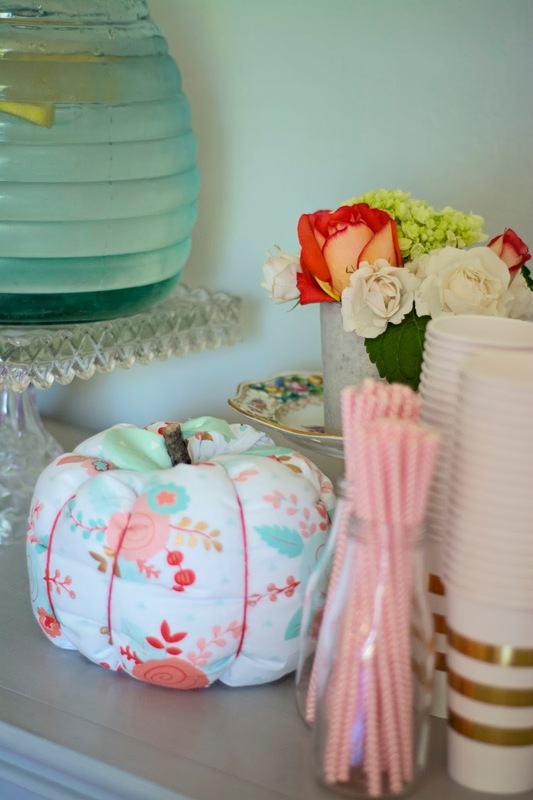 I used to worry that the way I decorate was too "off trend," but lately I'm realizing that the things I do that are the most funky and unexpected are often the things that make me smile the most. Also, the design world is huuuge, even if your style isn't the "it" thing of the moment, there is inspiration and validation out there. 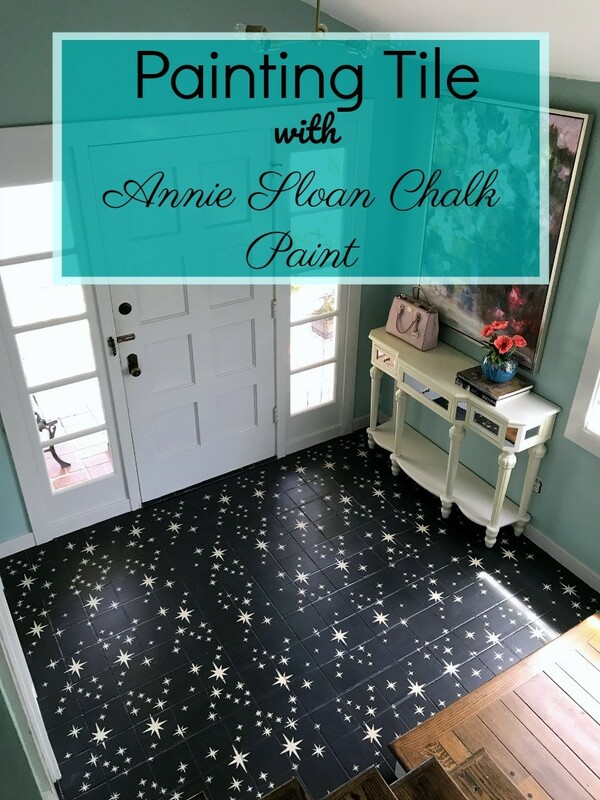 If you're wanting to add a little whimsy to your home, painting the floor is a great way to go. You can, of course, make it as conservative or as crazy as you want, and if it ends up looking like a hot mess you can always paint over it. It's about as low commitment as you can get! This is actually the second time I've painted my entryway tile with chalk paint. When we moved in it was this awful orange, and I painted it blue. That blue held up to heavy traffic really well for several years, but this year we had massive rain here in Northern California and our entryway flooded at least three times. After spending several nights under water the paint started bubbling up in a few places. It had been wet before from mopping or rain tracked in, but this was extreme and unusual water exposure. I'm totally comfortable painting again because we are going (I sincerely hope) to fix our flooding problems before the rainy season comes again. Alright then! Here's how you do it. 1. You probably won't need to do this, but in my case step one was to sand all of the places where the paint had bubbled up. 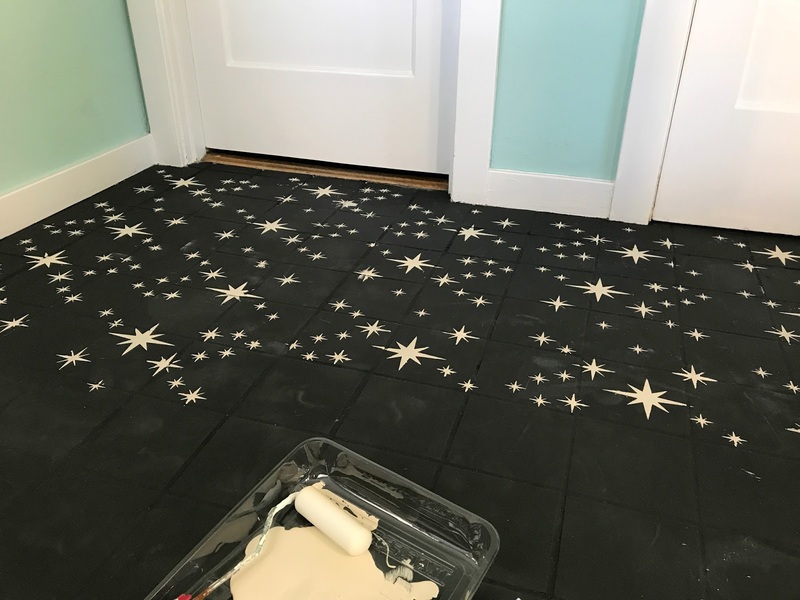 If the tile you're painting was previously painted then you should do this too. 2. Vacuum and then wash the tile really super well. I like to use the cleaner Simple Green and a good scrub brush. 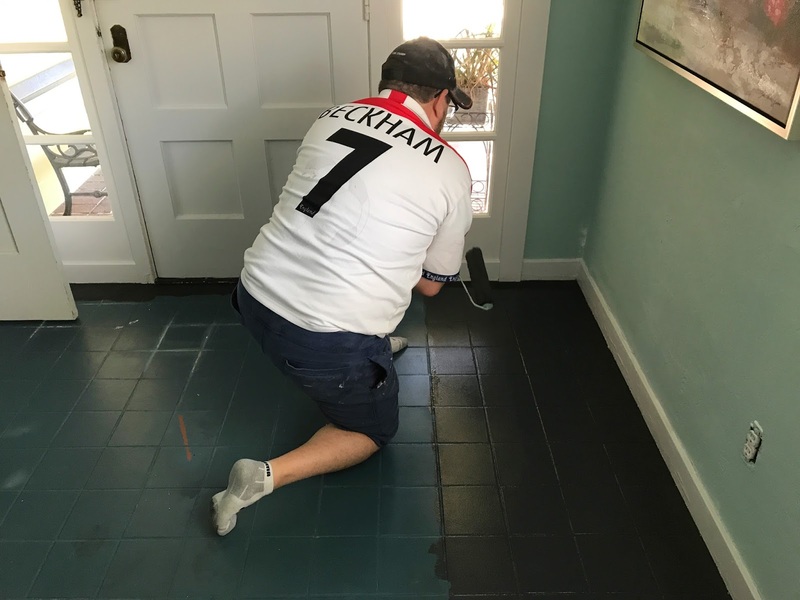 Really get in there and give it some elbow grease; you want to get the tile as clean as you can so the paint will stick. Rinse/wipe with a rag and clean water. 3. Once the tile is dry begin cutting the edges of the floor using an angled brush and your base color. I used Annie Sloan Chalk Paint in the color "graphite," which is fancy talk for black. 4. After the edges are cut it's time to roll. Use a roller cover that says it is for smooth surfaces. 5. Chalk paint drys pretty quickly, within about two hours you should be able to begin stenciling. Put on clean socks and be prepared for the paint to show where you walk. Even though it is dry, there will be scuff like marks from your feet. These will go away when you seal the paint. Get ready to stencil by putting your second paint color in paint pan, lining a paper plate with several paper towels, and getting a small roller brush with a foam roller. Place your stencil down. Lightly load your foam roller with paint and then roll it on the paper towel plate until it is nearly dry. If your roller is too wet the paint will bleed under the edges of the stencil. With one hand hold the stencil firmly on the ground and roll the paint with the other hand. I'll be honest, I had some trouble with the stencil. The paint wouldn't cover the areas that had grout lines, and I also got little flecks of paint outside of the lines. 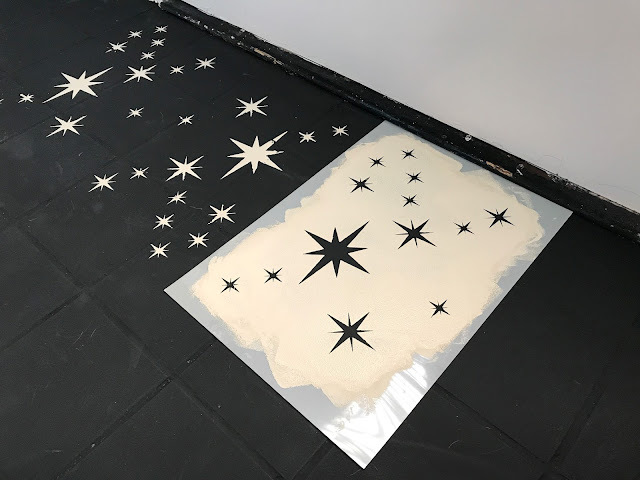 I decided not to mind that the stars had some light spots, and when everything was done I went back over the floor with a little paint brush and touched up the white flecks and places where the paint had spread out of the star lines. It wasn't as tedious to touch up as I thought it would be. All the little mistakes disappear when you are just looking at the whole floor. My best advice is don't give up. When I had about 1/4 of the floor done I felt like it looked awful and I had made too many mistakes. Marc convinced me that I was "too close" to the project and to just finish it up and see what I thought. I'm so glad I did! After a little touching up I felt that the overall effect was awesome. 6. Let the paint dry for a couple of hours and then wipe on the lacquer. Marc used a paint pad on a long handle. We let the first coat dry overnight and then did another coat in the morning. Of course, no one walked on it during that time. The lacquer dries nice and clear and gives a little sheen to the paint. 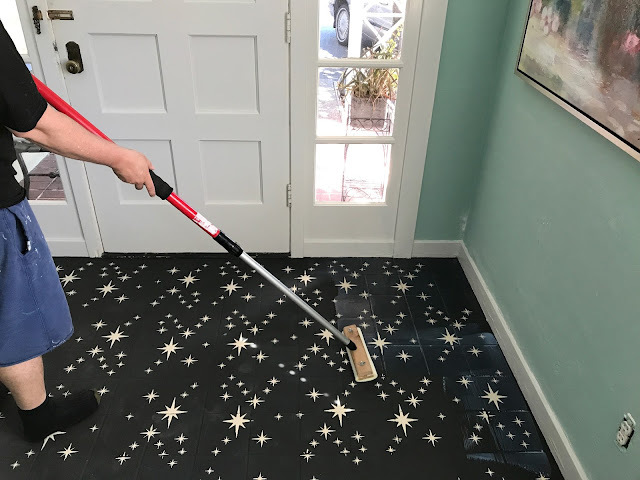 It is super durable and you can clean the floor with regular tile cleaner. 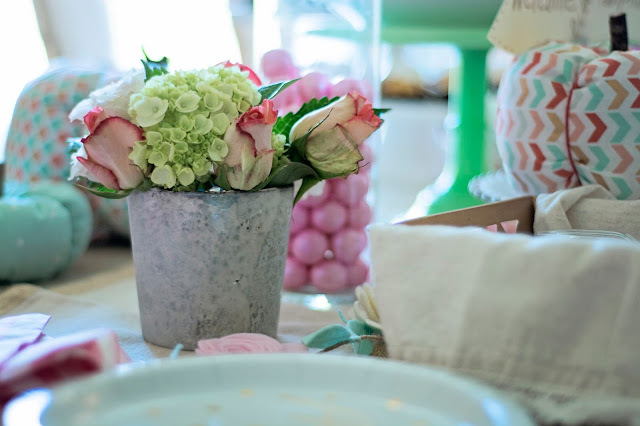 All of the Annie Sloan Chalk paint products clean up with regular soap and water. Bonus! And that, my friends, is how we did it. Let me know if you have any questions. 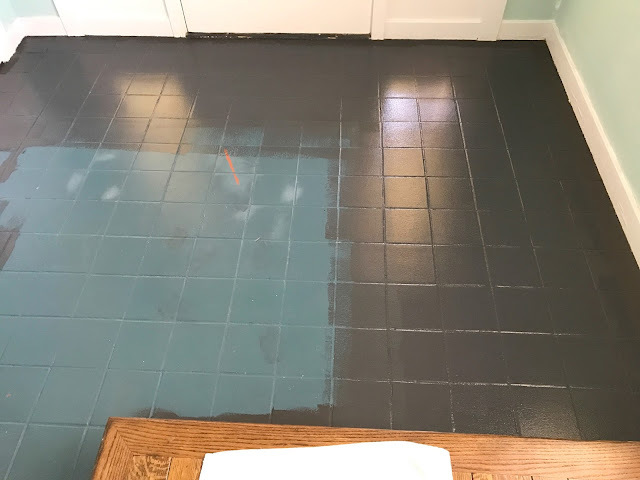 And if you're here because you have ugly floors, you might want to check out my kitchen makeover where I ripped up the old gross linoleum and painted the supfloor. Hi friend. So glad you stopped by. It's been awhile and I've missed you. Back in April my family took a tiny road trip to Pismo Beach and I want to tell you about it and share some photos because sharing is good and also because the older I get the more miserable my long term memory gets. If I don't record what happened I'm likely to forget. Am I the only one? We actually decided to take this trip at the last minute and since I didn't have a lot of time to research and plan we hired a travel planner to help us. You guys! It was the best decision ever! I'm including a link to the planner we used, Get Globetrotting, because her prices are super amazing and she came up for stuff for us to do that we totally would have missed on our own. We started out driving down the gorgeous California coast to our Bed and Breakfast in the tiny town of Arroyo Grande. Here's Ellie on one of the hammocks on the property. It was so perfect, only minutes from a darling downtown and maybe five more to the beach. Jonathan was only able to join us for part of the time because he had other plans with friends that he felt were more important than his family...and I'm only a little bitter. Bah! 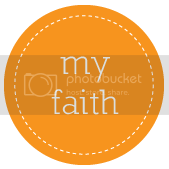 Do you remember those days when you were a teenager and your friends seemed so important and your family was just always there? I can remember coming home from college being so excited to see my friends and my parents being like, "Wait! WE'VE missed you..."
Anywho. We went to a fun restaurant. And then the next day we went to Morro Bay. The weather was a bit cool and overcast, but it was perfect for beach combing, and boy was that beach ready to be combed! There were hundreds of sea stars washed up on the sand, and the most interesting rocks we'd ever seen. It was treasure hunting at it's finest. We spent hours exclaiming over all the beautiful bits of rock and glass we found before heading to the Madonna Inn for lunch and their famous cake. This place is seriously over the top! The formal dining room wasn't open for lunch but we had to sneak in and wander around. And the slices of cake were like a whole cake. We could barely make a dent in them. We spent the rest of the day wandering the shops at Pismo Beach and playing games back at our inn. Jonathan arrived that night and the next day we got up early to ride dune buggies. This was a suggestion from our travel planner; I wouldn't have thought of it myself. Waiting for our ride out to the dunes. Ellie and I were both a bit timid on our buggies and mostly enjoyed tooling around up and down the hills and watching the boys be crazy. They both managed to get thrown off their bikes while jumping the hills. This both scared me and made me laugh. Ellie was really the only one who would stay still long enough for me to get a good photo. 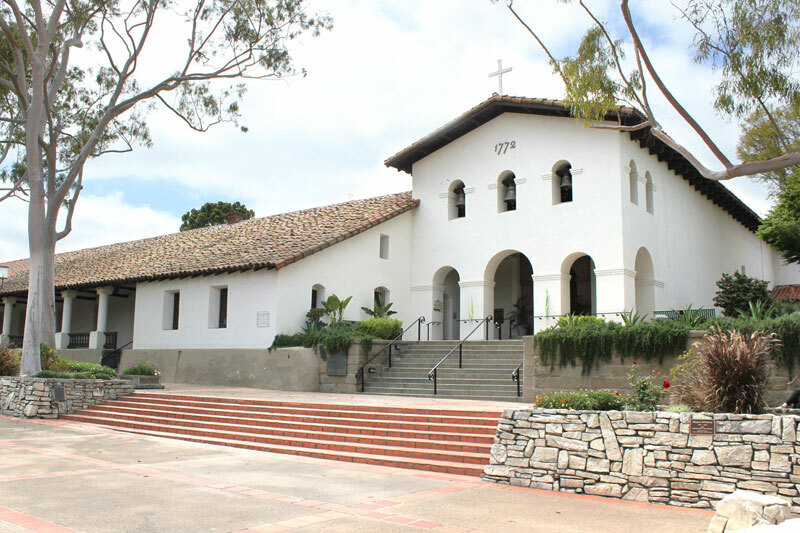 After the buggies we spent some time poking around the beautiful San Luis Obispo Mission. It was established in 1772. I had fun playing art history teacher and pointing out to J and E how those early builders would have been trying to mimic the opulence of the European churches they left behind. They didn't have the wealth or resources of the church in Europe so they got creative with their wood carvings and decorative paintings. I was totally hitting my geeky stride, and the kids were even interested, when all of a sudden this mass of noisy teenagers comes barging in and threw me off my groove. We were a little annoyed and about to leave when they all gathered up and started singing. On the last day of our vacation we visited Hearst's Castle. It was something I've wanted to do for a long time and while the kids were maybe a teensy bit bored, Marc and I thought it was fascinating. Jonathan bailed on us because his back was hurting from his dune buggy stunts, but Ellie was a trooper. All of it was almost obscenely extravagant, but man it was fun house to spy inside! I was maybe a little obsessed with the indoor swimming pool. Or a lot obsessed. It's just so sparkly! Who wouldn't want to swim there! I'm adding it to my bucket list right now, filed under "nearly impossible but it's worth dreaming." After that we drove back home along the coast making a little detour at Seal Beach so we could laugh at the antics of those funny seals and make up stories about them. Let's end with a video of their floppy goodness. Hi friend. I'm glad you're here! 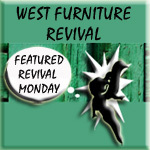 It's were I blog about all the things, like renovating my old ranch house, lots of DIY decorating and craft projects, recipes, and all sorts of creative goodness. Join me won't you? i read your blogs. update! © 2009-2016 BarnacleButt.blogspot.com - All rights reserved. 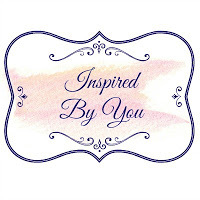 Please do not duplicate anything on this blog without written permission from the author.